I came to realize by browsing the Internet that, despite the list produced by "Christie's", revealed first and exclusively by "Decanter" on February 24th 2012 (read the article here), then officially unveiled shortly after during the "En Primeur" campaign, there is no other list including Bordeaux Chateaux names with Chinese translations in English written websites or French for that matter (as far as I could see). Yet, if you browse around through the Chinese websites, various listings of Bordeaux Chateaux names (and other notorious wineries from other regions) translated into Chinese are available online. The problem is that, although the list produced by Christie's has been approved by most of the listed Classified Growths, Christie's list is "NOT" official Per Se..... and even nowadays, 5 years later, it still has not yet been fully embraced by all people of the trade in Asia (other Auction Houses, Wine Merchants, Brokers, Wholesalers, Importers, Distributors, etc...) as the official and/or "go-to" list for Chinese translated Chateaux names. That is because, in Hong Kong for example, they have their own way to translate these names, as they primarily speak Cantonese (even if most also speak Mandarin/Putonghua). And in China, it is even worst, as they have various translations that also differ from Christie's list depending whether you are in Beijing, Tianjin, Guangzhou or Shenzhen for example. However, although Christie's list could have been taken as "THE" reference list and embraced for what it has been created for, meaning a way for everybody to speak the same language and write these names the same way, the reality in China is far more complex regarding how people agree to translate them. 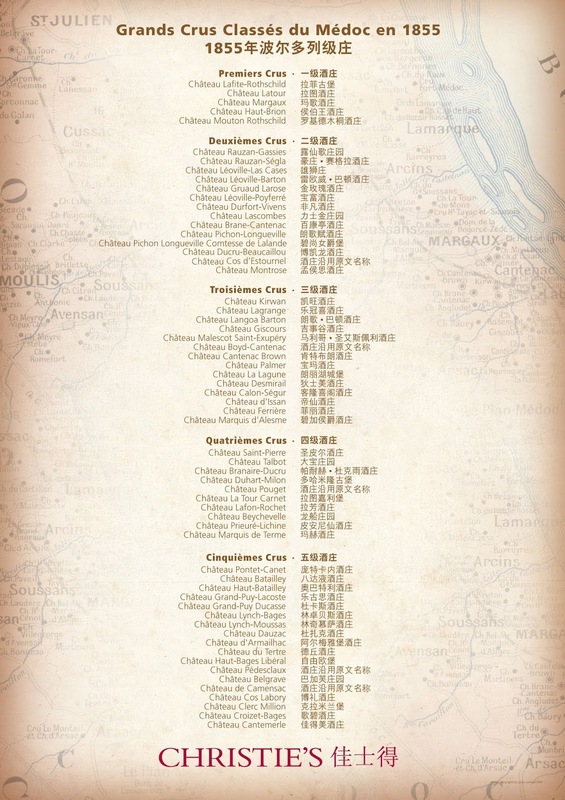 In any case, it seems that in China in general (including Hong Kong, Macau, Shanghai and Singapore) there is a consensus on at least 2 variants to translate these Chateaux names that are understood, recognized and used by most people in the trade. Variants that obviously and not surprisingly slightly differ from Christie's list. Even my colleagues at work said that Christie's list is erroneous and that people in China may not necessarily fully understand or comprehend Christie's translations, and will write some of them quite differently. However, as I couldn't find a list including these 2 variants on English or French written websites, I decided to compile them into a list for the western world to have access to them (and to realise at the same time that Christie's list of translated Bordeaux Classified Growths is not entirely satisfactory or sufficient in the Chinese world). Here is my compilation of the "Bordeaux 1855 Classification with Chinese Translations" (including the 2 variants) as accepted, understood and used in China and the Chinese speaking Asian market in general. NB: Owners of the Chateaux included in the list below, do not be offended or alarmed (as I know you can be quite susceptible when it comes to the order of the name of your Chateau within the "1855 Classification" list...), I just sorted the list by alphabetical order within each rank (1st Growth, 2nd Growth, etc..) to make it easier to read. I hope it will help some of you. You never know, this list might come handy at some point. I know that I was looking for one available online and could not find any despite Christie's list (which, as stated above, is not necessarily correct, accepted or even embraced by the trade... hence the reason for this post..) and I'm sure that I'm not the only one.... I hope to believe that the people working in the trade like the Chateaux themselves, but also the importers, distributors, merchants and more especially the people doing logistics, freights and shipping who usually have to deal with Chinese Customs will find it useful somewhat. 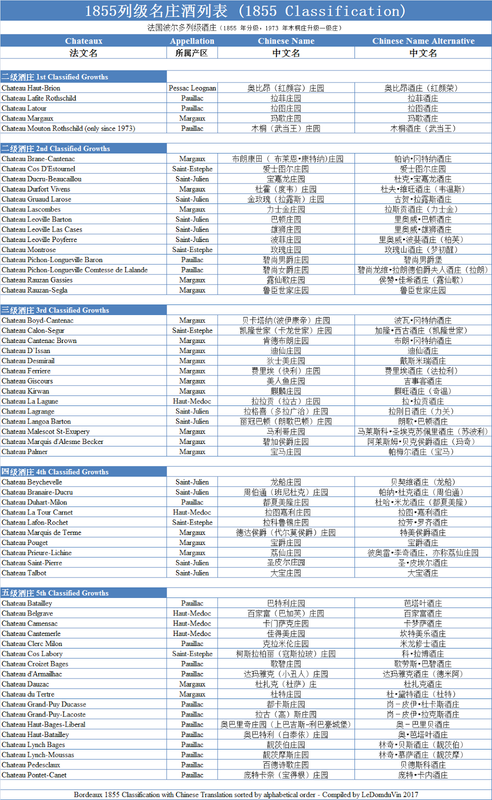 In fact, I think that by combining Christie's List and my compilation list, people will surely find a translated Chateaux name that they will be able to use depending on the context and the purpose. And frankly, since the changing tastes of the burgeoning Chinese middle class and the surge of Chinese investing in and drinking more and more French wines since 2010, this list might definitely come handy. That's all folks for today! and a big "THANK YOU" to all the readers, as your number has tremendously increased since I restarted writing on my blog a few months ago after nearly 5 years of quasi no posts or activities on this page. I really appreciate it and it inspires me to write more. Thank you. Thank you "best essay writers"
Glad you enjoyed reading the post and hope it will help you in some ways. Maybe, but not 1 website will give all the translations I gather in this post at one glance like on my table... you will have to search them one by one and you find it difficult to know which one is actually correct, while on my table above, these translations are the mostly accepted and used translations in Hong Kong and China for these wines. Thank you for your comment. Much Appreciated. Glad you found it helpful, it proves me that i'm not the only one searching for the correct translations of these Chateaux names on the internet. I did that table as I found it easier to see them all at one glance.